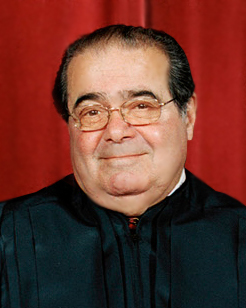 I'm not here to condemn those who have been shitting all over recently deceased Supreme Court Justice Antonin Scalia on social media. I understand that there are many valid reasons people have been upset with him over the years, and I've certainly not been immune to such feelings. I agree with those who hold the opinion that many of his legal decisions were harmful. I am not going to miss his presence on the court, and I see little use pretending otherwise. I'm also not inclined to think that just because someone died somehow means that we owe his or her memory a greater degree of respect than we afforded the person during their life. When someone dies, they are no longer around to hear what is being said about them. Calls of respect for the dead have never made much sense to me; however, I do acknowledge the importance of showing some measure of respect for those grieving the loss of the deceased. Losing a loved one is difficult enough without the spectacle of many so-called humanists celebrating it! All I'd really like to say in this brief post is this: no matter how much I may not have liked Justice Scalia's legal decisions, my negative opinion of them does not compel me to celebrate his passing. Even if I may have regarded him as a cruel and callous person at times, this does not excuse my behaving in a cruel and callous manner now. And if one of my objections to Scalia's decisions was the lack of empathy and compassion for others they reflected, then it would be at least somewhat hypocritical for me now to behave with a lack of empathy and compassion with regard to those mourning his death. For some thoughts on Scalia's legacy by someone who often disagreed with him, see this post from Jonathan Turley.